For the duration of the game, there was a feeling of dominance in favor of Ohio State. However, frequent errors and missed opportunities were a recurring theme all throughout. As a result, Wisconsin managed to spark a late surge and pull to within a score. Still, in the most dire of instances, the Silver Bullet defense stood strong, forcing a late interception to seal the deal and a 27-21 victory. The first half of Saturday night’s matchup was entirely in favor of the Buckeyes, with the only Badger points coming off silly Ohio State turnovers. In their second possession of the game, Wisconsin reached the red zone before Denzel Ward picked off Alex Hornibrook on his team’s four yard-line. Four plays later, quarterback JT Barrett threw a dart down the middle, hitting Terry McLaurin in stride for an 84-yard scoring strike to claim the early lead. On Ohio State’s following possession, pinned inside their own five, Barrett’s pass was snatched by Andrew Van Ginkel for the pick six to even the score at seven apiece. In their very next drive, the Buckeyes answered, as Parris Campbell hauled in a screen and took off for the 57-yard touchdown to go up 14-7. Early into the second quarter, true freshman tailback JK Dobbins bursted through a hole on a 77-yard scamper to the one yard-line. Barrett capped it off from there with a run up the gut to go up 21-7. In their next drive, running back Mike Weber fumbled inside his own 10, setting Wisconsin up for a field goal and the eventual score at halftime, 21-10. The two teams exchanged field goals early into the third quarter making the score 24-13, and on Ohio States ensuing drive, Buckeye wideout Johnnie Dixon was unable to bring in a beautiful deep ball from 44 yards out, which led to an Ohio State punt. The Buckeyes committed a couple of costly drops, but perhaps the biggest concern was the inconsistent deep ball of Barrett. The captain signal caller overthrew a handful of long balls that would have given Ohio State a convincing lead. Instead, Wisconsin had a chance to respond. On a third and short late in the third quarter, Barrett scrambled right and threw a short pass behind his tight end Marcus Baugh too late. The ball skipped off Baugh’s hand and into the waiting arms of a Badger defender. The turnover set up another Wisconsin score, this time by way of a one-yard run from Chris James. This pulled the Badgers within three after they converted the two-point conversion, 24-21. Ohio State booted a field goal to increase the deficit to six, and then Wisconsin had the ball back with a chance to tie or take the lead. Instead, after stalling on fourth and short, the Badgers elected to punt. So, now the Buckeyes had an opportunity to pull away. On third and five, Barrett underthrew a wide open Dobbins, forcing a punt, and leaving the door open for another Badger comeback. After reaching Buckeye territory, a holding call disrupted the momentum that Hornibrook and the Wisconsin offense generated. On fourth and 20, the sophomore quarterback was intercepted by Damon Webb to seal the deal. It certainly was not pretty, as questionable decisions and miscues that Ohio State undoubtedly wants back enabled Wisconsin to keep things close. 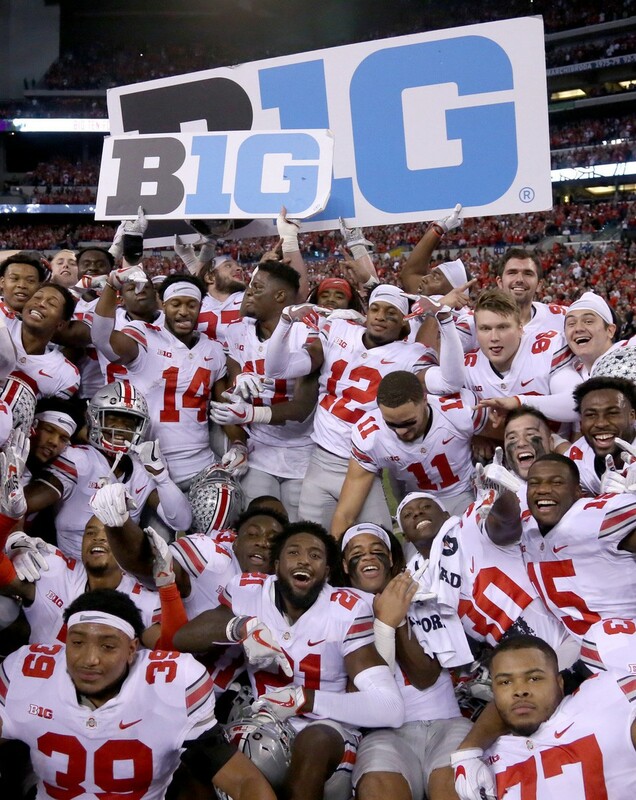 Nevertheless, the Buckeyes emerged as the champions of the Big Ten Conference. Dobbins was named the MVP of the game, notching 174 yards on the ground with just 17 carries, including 130 yards on two rushes alone. What’s next? The playoff committee will take the weekend to decide who is more worthy of the final playoff spot. Clemson, Oklahoma, and Georgia have already earned their respective positions, so the real debate comes with the last remaining position. Alabama and Ohio State are both vying for the remaining place in the playoffs. The Buckeyes boast the tougher schedule and the conference title. However, just one year ago, Ohio State managed to obtain a spot in the prestigious college football playoffs despite not even playing for the Big Ten title. The Crimson Tide find themselves in an identical spot, with only one loss compared to Ohio State’s two. Not to mention, one of those losses (a 31-point defeat) coming to an unranked Iowa club.